Professor Diyanath Samarasinghe, Sri Lanka, and FORUT has written the book ”Strategies to Address Alcohol Problems”. The book is a tool to achieve better results in alcohol prevention highly relevant in developing countries, as well as countries with a Western drinking culture and political tradition. This is the starting point of a new book written by Professor Diyanath Samarasinghe: ”Strategies to Address Alcohol Problems”, published by FORUT – Campaign for Development and Solidarity. The book is a tool to achieve better results in alcohol prevention by basing strategies on available knowledge, a systematic approach to setting aims and choosing interventions, and by learning from experience. 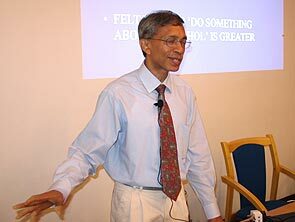 Diyanath Samarasinghe is a Professor of psychiatry at the University of Colombo, with a long-standing career as clinician, scholar and activist in the alcohol and drugs field in Sri Lanka. Furthermore, he draws upon the broad knowledge base of international alcohol research, which makes the book highly relevant also in other developing countries, as well as countries with a Western drinking culture and political tradition. The concept ”strategy” is in the book used as ”a broad approach to understanding and dealing with the fundamental issues relating to alcohol use and its consequences”. The main part of the book is a model for developing policies and interventions in a systematic way, learning from implemented activities and refining our understanding of what works and what does not work. The model is illustrated by examples and documentation throughout the text. Diyanath Samarasinghe: At the lauching of the Strategies book in Colombo, Sri Lanka. Before entering into the three levels of strategies, the author answers the question: ”Why is a response needed?”. In this chapter professor Samarasinghe gives an introduction to the full range of alcohol-related problems, as well as presenting some basic facts about the size of the problem. Given the broad range of adverse consequences of drinking, the author discusses a correspondingly broad strategy to address the alcohol problems. The book may be ordered from FORUT, free of charge: add@forut.no or fill in the form below. Remember your postal address.